In this blog series, we’re exploring ways to find clarity and calm. Part 1 was all about breathing, and you can read it here. Part 2 was focused on various meditation methods, which is found here. It’s a given that CRYSTALS can help us find peace and clarity. Right? The mineral kingdom has wisdom to share with us. Since the beginning of time crystals and stones have been used in various forms, including symbols of wealth, to connect to the “gods”, for healing, to keep time, or to gain enlightenment. In current realms, the energy of crystals and stones can help us remember our own innate wisdom and remind us of what we carry within us at all times. Selenite is a beautiful white mineral that is an important (and sometimes underrated) healing stone that is all about CLARITY. It’s a cleansing stone for energies or emotions that are no longer needed in your system or your physical space. It helps organize light coming in to your body to make it easier for cells to align it during transformations. Selenite can aid in opening your crown chakra, which opens you to higher knowledge. This is THE stone for gaining clarity! Clear Quartz is all about clarity and openness. It transmits Pure Divine Light, and is excellent for clearing and general healing on all levels, including the aura and all chakra’s. It heightens our intuition and perceptions, and is good for gaining insight during meditation. 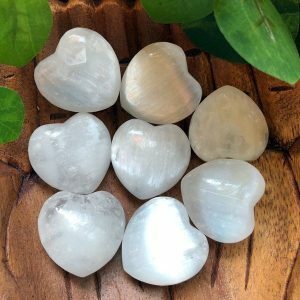 Quartz is an overall stone for any purpose, as it can also be programmed to help you align with your divine purpose, including clarity and light! Rose Quartz is maybe not one you’d think about for clarity. To me, being in a state of LOVE (not “in love” or romantic love, but a higher energy of all encompassing Love) and centered in our hearts is where we can find true clarity. Thus, Rose Quartz is all about Pure Divine Love and reminds us to return to our hearts. It asks us to find miracles in every day living, to learn new possibilities and new ways of being on the Earth with Love and an Open Heart. It can help open us to self-forgiveness, self-love, compassion for all, and the feeling that the Universal Truth is Love. Rose Quartz teaches us about confidence and acceptance for all parts of ourselves. As always, use your own intuition as to which stones and crystals might work for you to bring in more clarity! There are always many other choices. Ready to for more tips? Watch for Part 4 of this series coming soon!